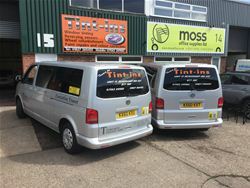 Tint-ins window tinting, architectural and automotive tinting solutions. We are window tinting specialists based in Tamworth, Staffordshire. We specialise in automotive window tinting, architectural window tinting, reversing sensors supplied and fitted, wheel refurbs as well as a registered fitter for replica omega italia protect your wheel rim from damage and enhance the look of your car at the same time. We also do vehicle remapping, and small body work repairs.